We all love those long and lazy summer nights, when you are sitting outside on your porch, at a beach bar or at a restaurant, enjoying a drink and a good chat. 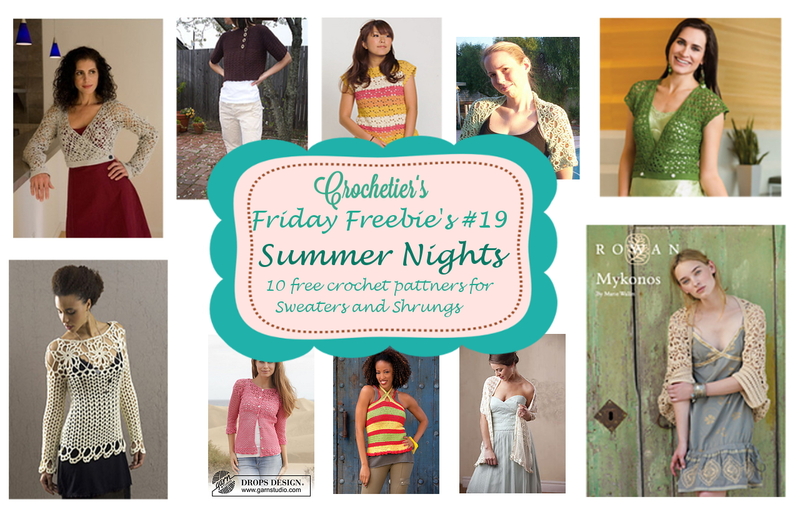 The perfect companion for those evenings are light summer sweaters, tops and shrugs – you will never freeze with this 10 free crochet patterns for summer sweaters and shrugs! Enjoy those beautiful and elegant patterns! Stunning! This is my personal favorite this week! This cardigan is an easy top down project. 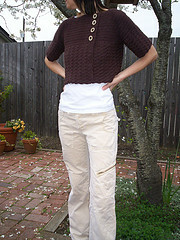 This double breasted cropped cardigan is meant to be close-fitting with a slightly boxy shape, but it is easy to adjust both the sleeve and body length. This pattern is a free ravelry download. Isn’t this sweater beautiful ? I love the colours! Click on “the pattern is available for free” – it will lead you to a patterns catalog, click on the picture you see here to download the pattern. Ooohhh summer feelings! Perfect for you summare vacation! With its deep V-neck, cap sleeves and crossover fitted waist, this pretty vest has lots of stylish flair. It is crocheted seamlessly in lustrous cotton yarn in a simple lace stitch that gives it soft stretch and drape. Crochet this lovely, slouch-style shrug, ideal for summer layering! This pattern is part of an e-book, including 8 free crochet designs for weddings! Tiny buttons and wide ribbon quickly convert this lace stole into a shrug that leaves your hands free for drinking, dancing, and eating cake. This easy crocheted top looks great in bright colored stripes. It ends at the hip with a flattering ruffle edging. What a beautiful pattern – and you can also wear it in fall! I do love all of those 10 free designs – one for each occasion! I hope you liked this weeks round up! If so share it with your friends!